If you want to create a new project, you should be able to follow along. Note that I’m not formally teaching you how to write Ruby here–I’m just teaching you enough to be able to guess what a particular line of code might do. (Admittedly, this is exactly how I did the LD37 project.) It’s sort of like taking a list of common phrases when traveling to a foreign country. Let’s say we’re building a narrative-only game (like To The Moon), or a game where we want to tightly control the player’s progression by giving items or skills at key narrative points (sort of like Legend of Zelda). We could leave this window in, but it’s going to contribute to a tighter experience for the player if we remove unnecessary bits. The player won’t be distracted by trying to figure out which features are used and which aren’t, and won’t feel like we hacked this together. Step 1: Where’s the code that affects this? As discussed in the last post, there’s a lot of Ruby code in a default RPG Maker project. 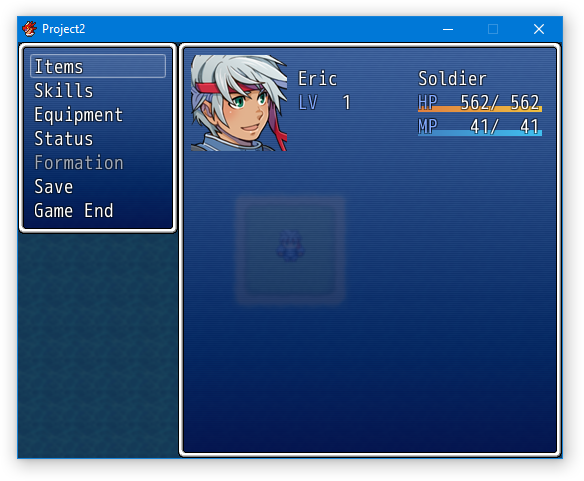 It’s intimidating–unless you have both copious programming and RPG Maker experience, it takes some effort to scan through it and figure out what it does. Fortunately, we have a few guidelines to help us. We know we’re looking for a window, so odds are the code is in a class that starts with Window_ or Scene_ (since scenes often show and hide windows on the screen). Within these groupings, we know we’re probably looking for a class with Gold, Menu or Status in the name (since we’re looking for the gold window on the status menu screen). Since we have a vague idea of what the class that shows the gold window might be named, we can identify possible classes and skim them to see if they actually affect whether or not it’s shown on the menu screen. Upon further inspection, this class has methods like initialize, refresh, and open. It has properties like window_width that define how the gold window is shown, and value and currency_unit that define what the gold window shows. (How do we know that? Well, the code for a class is contained in the class block, and each def block represents a property or method within that class. Each of these blocks is closed by an end statement. Indentation and comments–lines that start with a #, which indicate to Ruby they shouldn’t be executed–are used to make it more readable. After skimming the code, it looks like Window_Gold doesn’t actually help us–it defines what the gold window looks like when it’s shown, not whether it’s shown. That’s OK, because we’ve narrowed down our search. You might be tempted to think that we could just delete Window_Gold and be done, but code doesn’t exist in a vacuum. We should assume there’s code in another class that’s creating a new instance of Window_Gold. If we simply delete Window_Gold, then that code will cause a crash. 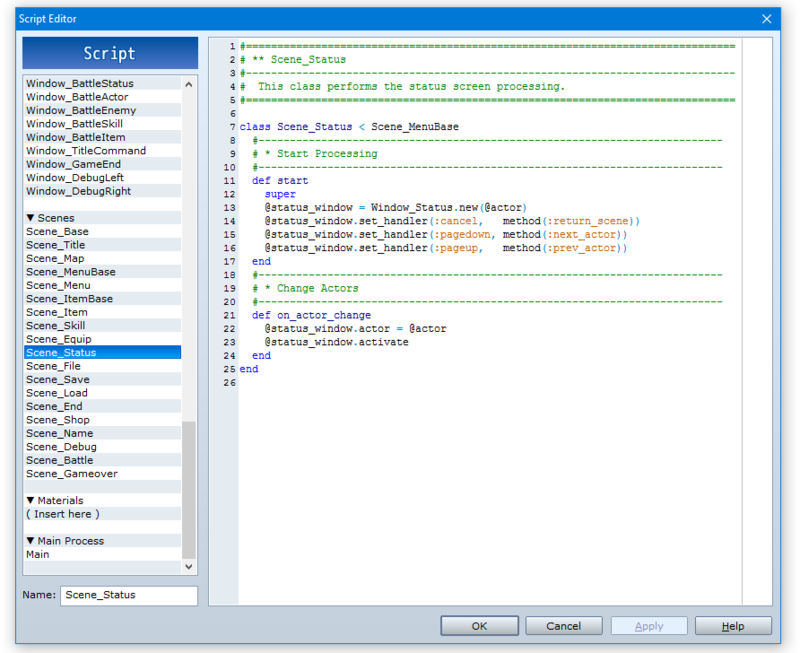 … but this seems to reference actors and menu commands (created by the set_handler method that’s called in start). We know our gold window is simpler than that. That’s it. Right there in the start method, there’s a call to a create_gold_window method. We’re essentially saying, “whenever we’re displaying a Menu scene, store a copy of the Gold window in the scene’s @gold_window field.” That way, we can reference the gold_window whenever necessary. We’re also creating a new instance of the Window_Gold class to store in that field (which will call the initialization code we saw earlier). Remember: a class is a template–an abstract concept. An object–in this case, an instance of the Window_Class–is a copy of that template that we can work with. This code positions the window on the screen. Rather than remove the code outright, we’re going to do something called commenting out. The effect is the same, but it’s easily reversible. Remember how we said that lines that start with a # aren’t executed? All we’ll do is add a # before the code we want to remove, turning it into a comment. If we ever want it back, we just remove the #. That’s all we have to do. 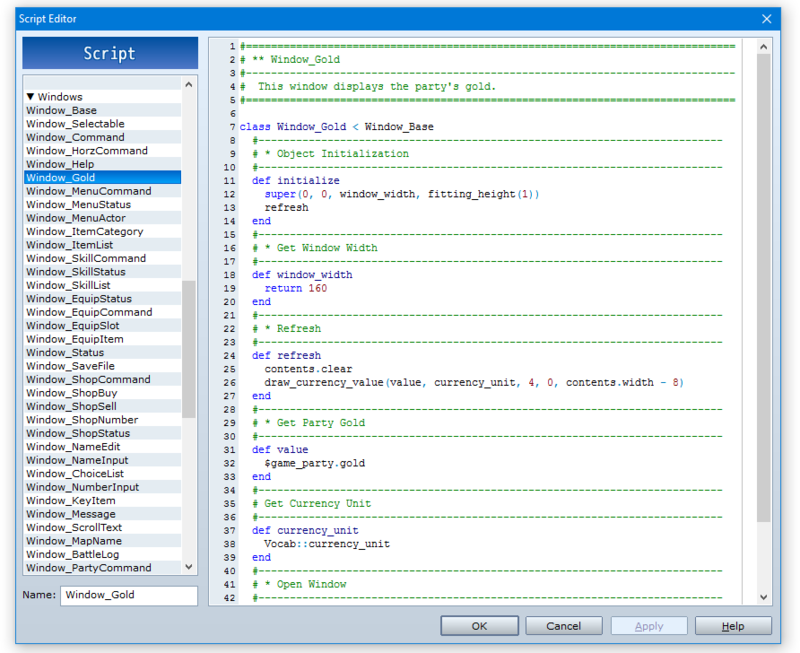 When the Menu scene is created, it will no longer create an instance of Window_Gold. Again, note that we commented out not just the method definition for create_gold_window, but also the reference in start that calls it. We commented out any code that references @gold_window, not just the line that creates it. This prevents crashes. It’s always good practice to use Ctrl-F to make sure you’ve removed all references to the class, method, or variable you’re removing. Now that we’ve made our change, let’s test it by running the game. For the above example, I commented out the create_gold_window method definition, but I left the call to it in start. Script ‘Scene_Menu’ line 14: Whatever went wrong, happened in line 14 of the Scene_Menu script. That’s a good place to start looking, and (generally speaking) will be the line of code that will be changed. Undefined local variable or method “create_gold_window” for #<SceneMenu>: I removed its method definition in Scene_Menu, so create_gold_window is undefined. We’re referencing it (in script Scene_Menu, line 14), but Ruby doesn’t know what we’re referring to. When we get this error, we’ll simply repeat the process to figure out what went wrong, and change it. This might feel like a lot of work for a simple change. We had to make a lot of decisions just to remove a simple bit of functionality. 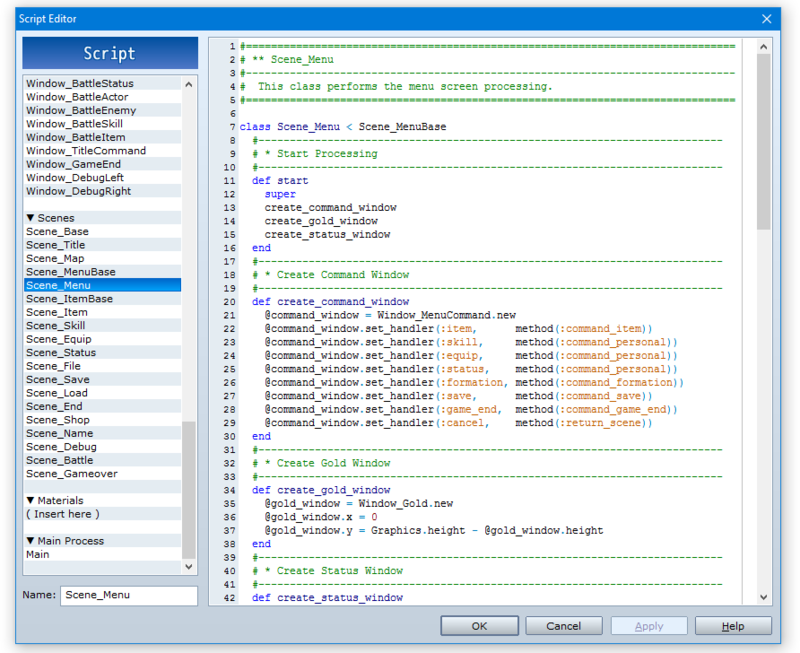 However, they’re simple decisions–and the more you write code and work with RPG Maker, the easier they’ll be, because you’ll be familiar with the general patterns to the code. This entry was posted in Gaming, Programming and tagged gamedev, RPG Maker by Dylan Wolf. Bookmark the permalink.